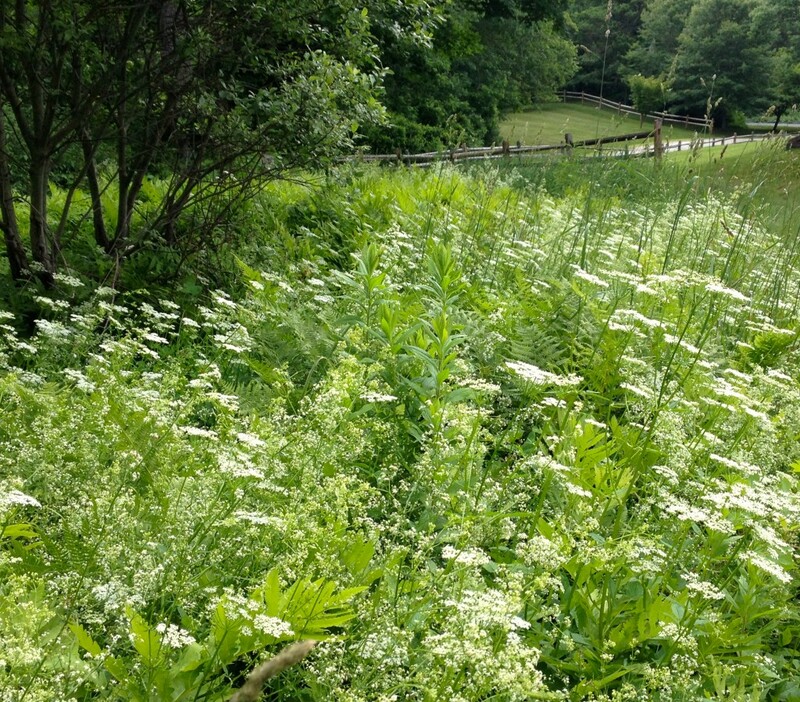 This is the time of year when Queen Anne’s Lace flowers in drifts of white across the open fields and along the roadsides of the Berkshires. An immigrant from Europe, this biennial was supposedly named for Queen Anne of Great Britain. The pinpoint of purply red at the center of each white flower is said to represent the droplet of blood left by Queen Anne when she pricked herself making lace. It’s a pretty name, in any case, and a nice story, and I hope nothing is taken away from the romance of it to report that the “droplet of blood” is actually a pigment called anthocyanin which acts as an insect magnet. Queen Anne’s Lace (Daucus carota) is also called “Wild Carrot” and is considered by many to be edible in its first year of life. The Romans ate it as a vegetable and the American Colonists boiled the taproots in wine. Its sugar content is second only to that of the beet among root vegetables, and it’s been used as a sweetener in various cultures around the world. 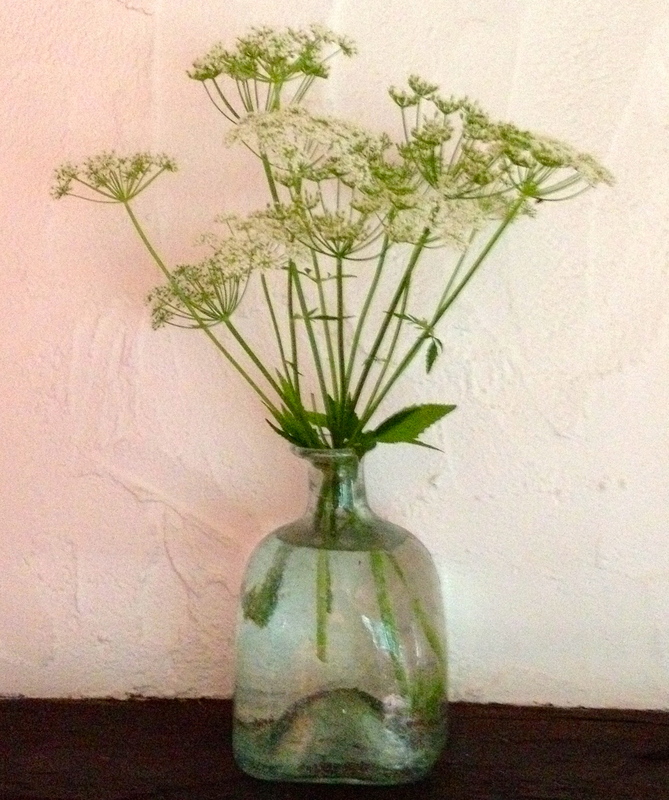 I mention this not to suggest you immediately start working Queen Anne’s Lace into your diet (in fact several similar-looking plants are quite poisonous), but as a way of trying to mitigate the plant’s designation as an invasive and “noxious” weed. It’s true that it isn’t native to this country and that its tiny seeds, spread by the wind, root quickly across the uncultivated landscape. But some animals have benefitted from its arrival, caterpillars of the Eastern Black Swallowtail butterfly eat the leaves, while bees drink its nectar. And what could be prettier than a bank of Queen Anne’s Lace growing wild along a country lane? To my mind this common wildflower with its fern-like fronds and frothy, intricate flower heads is as beautiful as the most prized perennial. The great American poet William Carlos Williams appears to have felt the same way. Here’s a poem of his on the subject. I love the way you find the perfect poem for your posts. Thanks, Patty. We don’t see enough of old W.C.W. these days. So happy to come across this one! 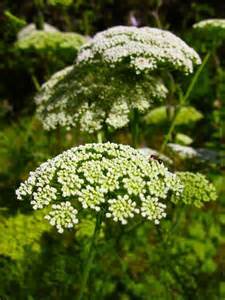 …Dioscorides knew about Wild carrot and stated that it brought forth the menses and aborted an embryo. to do this he said take its seed. Scribonius Largus (ad 47) (a physician who accompanied the Emperor Claudius to Britain) and Soranus (a Greek physician in Rome) one of the earliest writers to talk about carrot seed and fertility and was the first to include wild carrot seeds in a recipe for contraception. The root of the domesticated carrot contains no less than 89 percent of water and about 4.5 percent sugar making them a great snack food for dieters. Common garden carrots are a domesticated form of the wild carrot that has been selectively bred for a large, tender taproot. 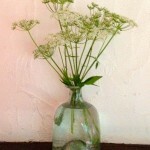 The seed of the wild carrot, commonly know as Queen Anne’s Lace, is the part used medicinally. 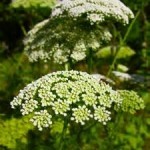 Wild carrot seeds have been used historically as a natural morning after contraceptive, but this use remains controversial. Wild carrot seeds are not readily available commercially, but can be wildcrafted by those who are very confident in their plant identification skills. 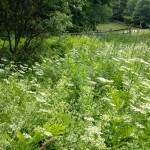 Wild carrot is similar in appearance to the deadly poison hemlock, Conium maculatum.